Google recently released a new way to prevent spam: the invisible reCaptcha. The HubSpot product team is introducing this new tool on all forms in our product soon, because it'll help customers generate more legitimate leads. Want to give it a try? You only need a few steps to add invisible reCaptcha to your website. You're probably already familiar with reCaptcha, the checkbox you sometimes have to click on before you can submit a form on a website. If the algorithm thinks that you're a human, it will validate the reCaptcha without any further action on your part. If not, it'll serve up a bunch of images that you'll have to categorize before you can continue. So what's invisible reCaptcha? Well, it's actually exactly the same - it just doesn't have a checkbox. In fact, you won't see the field at all. Like with a traditional reCaptcha, an additional challenge will sometimes appear if it thinks you're not a human, but with invisible reCaptcha, this happens when you submit the form (and the submission will really be sent once you validate the image test) instead of when you tick the checkbox. You can give it a try here to see the full behavior. Let's add invisible reCaptcha to a website. First, we need to register on this page to get an API key. Choose 'Register a new website', then click on 'invisible reCaptcha'. Entering a domain isn't necessary, but it can help prevent someone from using your key, so we'd recommend entering it if you know where your reCaptcha will live. If you don't want to put a domain, don't forget to uncheck the option in advanced settings. You will get two keys: a public one, which will be used for the front end call, and a private one, for back end verification (which you shouldn't share). See the Pen &amp;amp;amp;amp;amp;amp;amp;amp;amp;amp;amp;amp;amp;amp;amp;amp;amp;lt;a href="https://codepen.io/gabrielalanza/pen/zEYdQp/"&amp;amp;amp;amp;amp;amp;amp;amp;amp;amp;amp;amp;amp;amp;amp;amp;amp;gt;zEYdQp&amp;amp;amp;amp;amp;amp;amp;amp;amp;amp;amp;amp;amp;amp;amp;amp;amp;lt;/a&amp;amp;amp;amp;amp;amp;amp;amp;amp;amp;amp;amp;amp;amp;amp;amp;amp;gt; by Gabriela Lanza (&amp;amp;amp;amp;amp;amp;amp;amp;amp;amp;amp;amp;amp;amp;amp;amp;amp;lt;a href="https://codepen.io/gabrielalanza"&amp;amp;amp;amp;amp;amp;amp;amp;amp;amp;amp;amp;amp;amp;amp;amp;amp;gt;@gabrielalanza&amp;amp;amp;amp;amp;amp;amp;amp;amp;amp;amp;amp;amp;amp;amp;amp;amp;lt;/a&amp;amp;amp;amp;amp;amp;amp;amp;amp;amp;amp;amp;amp;amp;amp;amp;amp;gt;) on &amp;amp;amp;amp;amp;amp;amp;amp;amp;amp;amp;amp;amp;amp;amp;amp;amp;lt;a href="https://codepen.io"&amp;amp;amp;amp;amp;amp;amp;amp;amp;amp;amp;amp;amp;amp;amp;amp;amp;gt;CodePen&amp;amp;amp;amp;amp;amp;amp;amp;amp;amp;amp;amp;amp;amp;amp;amp;amp;lt;/a&amp;amp;amp;amp;amp;amp;amp;amp;amp;amp;amp;amp;amp;amp;amp;amp;amp;gt;. See the Pen &amp;amp;amp;amp;amp;amp;amp;amp;amp;amp;amp;amp;amp;lt;a href="https://codepen.io/gabrielalanza/pen/KXKXpa/"&amp;amp;amp;amp;amp;amp;amp;amp;amp;amp;amp;amp;amp;gt;KXKXpa&amp;amp;amp;amp;amp;amp;amp;amp;amp;amp;amp;amp;amp;lt;/a&amp;amp;amp;amp;amp;amp;amp;amp;amp;amp;amp;amp;amp;gt; by Gabriela Lanza (&amp;amp;amp;amp;amp;amp;amp;amp;amp;amp;amp;amp;amp;lt;a href="https://codepen.io/gabrielalanza"&amp;amp;amp;amp;amp;amp;amp;amp;amp;amp;amp;amp;amp;gt;@gabrielalanza&amp;amp;amp;amp;amp;amp;amp;amp;amp;amp;amp;amp;amp;lt;/a&amp;amp;amp;amp;amp;amp;amp;amp;amp;amp;amp;amp;amp;gt;) on &amp;amp;amp;amp;amp;amp;amp;amp;amp;amp;amp;amp;amp;lt;a href="https://codepen.io"&amp;amp;amp;amp;amp;amp;amp;amp;amp;amp;amp;amp;amp;gt;CodePen&amp;amp;amp;amp;amp;amp;amp;amp;amp;amp;amp;amp;amp;lt;/a&amp;amp;amp;amp;amp;amp;amp;amp;amp;amp;amp;amp;amp;gt;. See the Pen &amp;amp;amp;amp;amp;amp;amp;amp;amp;amp;amp;amp;amp;lt;a href="https://codepen.io/gabrielalanza/pen/ZXEXbX/"&amp;amp;amp;amp;amp;amp;amp;amp;amp;amp;amp;amp;amp;gt;ZXEXbX&amp;amp;amp;amp;amp;amp;amp;amp;amp;amp;amp;amp;amp;lt;/a&amp;amp;amp;amp;amp;amp;amp;amp;amp;amp;amp;amp;amp;gt; by Gabriela Lanza (&amp;amp;amp;amp;amp;amp;amp;amp;amp;amp;amp;amp;amp;lt;a href="https://codepen.io/gabrielalanza"&amp;amp;amp;amp;amp;amp;amp;amp;amp;amp;amp;amp;amp;gt;@gabrielalanza&amp;amp;amp;amp;amp;amp;amp;amp;amp;amp;amp;amp;amp;lt;/a&amp;amp;amp;amp;amp;amp;amp;amp;amp;amp;amp;amp;amp;gt;) on &amp;amp;amp;amp;amp;amp;amp;amp;amp;amp;amp;amp;amp;lt;a href="https://codepen.io"&amp;amp;amp;amp;amp;amp;amp;amp;amp;amp;amp;amp;amp;gt;CodePen&amp;amp;amp;amp;amp;amp;amp;amp;amp;amp;amp;amp;amp;lt;/a&amp;amp;amp;amp;amp;amp;amp;amp;amp;amp;amp;amp;amp;gt;. This function will just submit the form, but you can add any validation you want at this point. 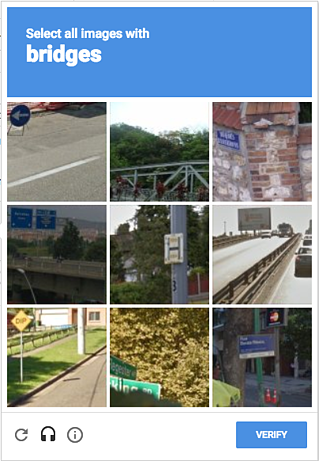 Keep in mind that everything here will be executed after the person completes the reCaptcha. At HubSpot, we approached this problem a bit differently. We needed our form validation to happen before we displayed any potential reCaptcha to the visitor. For example, if the email address isn't formatted correctly, or if a required field is absent, we want to handle that first, which is why we didn't bind reCaptcha directly to the submit button. See the Pen &amp;amp;amp;amp;amp;amp;amp;amp;amp;amp;amp;amp;amp;lt;a href="https://codepen.io/gabrielalanza/pen/OxJxMV/"&amp;amp;amp;amp;amp;amp;amp;amp;amp;amp;amp;amp;amp;gt;OxJxMV&amp;amp;amp;amp;amp;amp;amp;amp;amp;amp;amp;amp;amp;lt;/a&amp;amp;amp;amp;amp;amp;amp;amp;amp;amp;amp;amp;amp;gt; by Gabriela Lanza (&amp;amp;amp;amp;amp;amp;amp;amp;amp;amp;amp;amp;amp;lt;a href="https://codepen.io/gabrielalanza"&amp;amp;amp;amp;amp;amp;amp;amp;amp;amp;amp;amp;amp;gt;@gabrielalanza&amp;amp;amp;amp;amp;amp;amp;amp;amp;amp;amp;amp;amp;lt;/a&amp;amp;amp;amp;amp;amp;amp;amp;amp;amp;amp;amp;amp;gt;) on &amp;amp;amp;amp;amp;amp;amp;amp;amp;amp;amp;amp;amp;lt;a href="https://codepen.io"&amp;amp;amp;amp;amp;amp;amp;amp;amp;amp;amp;amp;amp;gt;CodePen&amp;amp;amp;amp;amp;amp;amp;amp;amp;amp;amp;amp;amp;lt;/a&amp;amp;amp;amp;amp;amp;amp;amp;amp;amp;amp;amp;amp;gt;. See the Pen &amp;amp;amp;amp;amp;amp;amp;amp;amp;amp;amp;amp;amp;lt;a href="https://codepen.io/gabrielalanza/pen/dVyVGa/"&amp;amp;amp;amp;amp;amp;amp;amp;amp;amp;amp;amp;amp;gt;dVyVGa&amp;amp;amp;amp;amp;amp;amp;amp;amp;amp;amp;amp;amp;lt;/a&amp;amp;amp;amp;amp;amp;amp;amp;amp;amp;amp;amp;amp;gt; by Gabriela Lanza (&amp;amp;amp;amp;amp;amp;amp;amp;amp;amp;amp;amp;amp;lt;a href="https://codepen.io/gabrielalanza"&amp;amp;amp;amp;amp;amp;amp;amp;amp;amp;amp;amp;amp;gt;@gabrielalanza&amp;amp;amp;amp;amp;amp;amp;amp;amp;amp;amp;amp;amp;lt;/a&amp;amp;amp;amp;amp;amp;amp;amp;amp;amp;amp;amp;amp;gt;) on &amp;amp;amp;amp;amp;amp;amp;amp;amp;amp;amp;amp;amp;lt;a href="https://codepen.io"&amp;amp;amp;amp;amp;amp;amp;amp;amp;amp;amp;amp;amp;gt;CodePen&amp;amp;amp;amp;amp;amp;amp;amp;amp;amp;amp;amp;amp;lt;/a&amp;amp;amp;amp;amp;amp;amp;amp;amp;amp;amp;amp;amp;gt;. This gives you perfect freedom on the order in which you decide to run functions. For example, you can call one of your endpoints first, wait for its response, then show the reCaptcha test after. But there are tons of other possible use cases, and you can time the challenge in whatever way works best for your situation. We should note that the "execute" function call works perfectly when there's only one reCaptcha rendered on the page. But as soon as you have two of them (invisible or not), they become unusable. Think about it - how would the Google script know which challenge you want to render? The one linked to your first form? Or the second one? Therefore, if you have multiple reCaptchas on a page, you need a way to identify which is which. So here's the solution we chose to implement at HubSpot, because we needed to give customers the ability to put several forms on their pages, with or without reCaptcha. This solution also similar to the way you'd implement a normal reCaptcha, so it might be the easiest solution if you're swapping your traditional reCaptchas for invisible reCaptchas. See the Pen &amp;amp;amp;amp;amp;amp;amp;amp;amp;amp;amp;lt;a href="https://codepen.io/gabrielalanza/pen/jGOGqy/"&amp;amp;amp;amp;amp;amp;amp;amp;amp;amp;amp;gt;jGOGqy&amp;amp;amp;amp;amp;amp;amp;amp;amp;amp;amp;lt;/a&amp;amp;amp;amp;amp;amp;amp;amp;amp;amp;amp;gt; by Gabriela Lanza (&amp;amp;amp;amp;amp;amp;amp;amp;amp;amp;amp;lt;a href="https://codepen.io/gabrielalanza"&amp;amp;amp;amp;amp;amp;amp;amp;amp;amp;amp;gt;@gabrielalanza&amp;amp;amp;amp;amp;amp;amp;amp;amp;amp;amp;lt;/a&amp;amp;amp;amp;amp;amp;amp;amp;amp;amp;amp;gt;) on &amp;amp;amp;amp;amp;amp;amp;amp;amp;amp;amp;lt;a href="https://codepen.io"&amp;amp;amp;amp;amp;amp;amp;amp;amp;amp;amp;gt;CodePen&amp;amp;amp;amp;amp;amp;amp;amp;amp;amp;amp;lt;/a&amp;amp;amp;amp;amp;amp;amp;amp;amp;amp;amp;gt;. We also must be careful not to forget the last parameter, because you'll need it to make several reCaptchas work at the same time. See the Pen &amp;amp;amp;amp;amp;amp;amp;amp;amp;amp;amp;amp;amp;lt;a href="https://codepen.io/gabrielalanza/pen/qPBPZQ/"&amp;amp;amp;amp;amp;amp;amp;amp;amp;amp;amp;amp;amp;gt;qPBPZQ&amp;amp;amp;amp;amp;amp;amp;amp;amp;amp;amp;amp;amp;lt;/a&amp;amp;amp;amp;amp;amp;amp;amp;amp;amp;amp;amp;amp;gt; by Gabriela Lanza (&amp;amp;amp;amp;amp;amp;amp;amp;amp;amp;amp;amp;amp;lt;a href="https://codepen.io/gabrielalanza"&amp;amp;amp;amp;amp;amp;amp;amp;amp;amp;amp;amp;amp;gt;@gabrielalanza&amp;amp;amp;amp;amp;amp;amp;amp;amp;amp;amp;amp;amp;lt;/a&amp;amp;amp;amp;amp;amp;amp;amp;amp;amp;amp;amp;amp;gt;) on &amp;amp;amp;amp;amp;amp;amp;amp;amp;amp;amp;amp;amp;lt;a href="https://codepen.io"&amp;amp;amp;amp;amp;amp;amp;amp;amp;amp;amp;amp;amp;gt;CodePen&amp;amp;amp;amp;amp;amp;amp;amp;amp;amp;amp;amp;amp;lt;/a&amp;amp;amp;amp;amp;amp;amp;amp;amp;amp;amp;amp;amp;gt;. There are other parameters we could add to this render function, but we'll touch on them later (see the personalization section). You can see that the rendering function returns an ID - it's important to save this. For example, if you code in ReactJS (like we do at HubSpot), this can be an attribute of the state of your component. But whatever language you use, saving it is the important part. 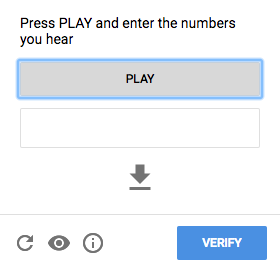 Once you do that, every reCaptcha will have a unique ID, known both by our program and by Google. See the Pen &amp;amp;amp;amp;amp;amp;amp;amp;amp;amp;amp;amp;amp;lt;a href="https://codepen.io/gabrielalanza/pen/JrjrKm/"&amp;amp;amp;amp;amp;amp;amp;amp;amp;amp;amp;amp;amp;gt;JrjrKm&amp;amp;amp;amp;amp;amp;amp;amp;amp;amp;amp;amp;amp;lt;/a&amp;amp;amp;amp;amp;amp;amp;amp;amp;amp;amp;amp;amp;gt; by Gabriela Lanza (&amp;amp;amp;amp;amp;amp;amp;amp;amp;amp;amp;amp;amp;lt;a href="https://codepen.io/gabrielalanza"&amp;amp;amp;amp;amp;amp;amp;amp;amp;amp;amp;amp;amp;gt;@gabrielalanza&amp;amp;amp;amp;amp;amp;amp;amp;amp;amp;amp;amp;amp;lt;/a&amp;amp;amp;amp;amp;amp;amp;amp;amp;amp;amp;amp;amp;gt;) on &amp;amp;amp;amp;amp;amp;amp;amp;amp;amp;amp;amp;amp;lt;a href="https://codepen.io"&amp;amp;amp;amp;amp;amp;amp;amp;amp;amp;amp;amp;amp;gt;CodePen&amp;amp;amp;amp;amp;amp;amp;amp;amp;amp;amp;amp;amp;lt;/a&amp;amp;amp;amp;amp;amp;amp;amp;amp;amp;amp;amp;amp;gt;. See the Pen &amp;amp;amp;amp;amp;amp;amp;amp;amp;amp;amp;amp;amp;lt;a href="https://codepen.io/gabrielalanza/pen/veYeKq/"&amp;amp;amp;amp;amp;amp;amp;amp;amp;amp;amp;amp;amp;gt;veYeKq&amp;amp;amp;amp;amp;amp;amp;amp;amp;amp;amp;amp;amp;lt;/a&amp;amp;amp;amp;amp;amp;amp;amp;amp;amp;amp;amp;amp;gt; by Gabriela Lanza (&amp;amp;amp;amp;amp;amp;amp;amp;amp;amp;amp;amp;amp;lt;a href="https://codepen.io/gabrielalanza"&amp;amp;amp;amp;amp;amp;amp;amp;amp;amp;amp;amp;amp;gt;@gabrielalanza&amp;amp;amp;amp;amp;amp;amp;amp;amp;amp;amp;amp;amp;lt;/a&amp;amp;amp;amp;amp;amp;amp;amp;amp;amp;amp;amp;amp;gt;) on &amp;amp;amp;amp;amp;amp;amp;amp;amp;amp;amp;amp;amp;lt;a href="https://codepen.io"&amp;amp;amp;amp;amp;amp;amp;amp;amp;amp;amp;amp;amp;gt;CodePen&amp;amp;amp;amp;amp;amp;amp;amp;amp;amp;amp;amp;amp;lt;/a&amp;amp;amp;amp;amp;amp;amp;amp;amp;amp;amp;amp;amp;gt;. Now that our front end is ready, let's check the visitor's response. Once we receive our form submission in our backend service, we have to check that the given reCaptcha response is correct. First, how is the response passed to our service? In most cases, an attribute "g-recaptcha-response" is added as parameter, and sent through the POST request at submission time. See the Pen &amp;amp;amp;amp;amp;amp;amp;amp;amp;lt;a href="https://codepen.io/gabrielalanza/pen/Yrzrpo/"&amp;amp;amp;amp;amp;amp;amp;amp;amp;gt;Yrzrpo&amp;amp;amp;amp;amp;amp;amp;amp;amp;lt;/a&amp;amp;amp;amp;amp;amp;amp;amp;amp;gt; by Gabriela Lanza (&amp;amp;amp;amp;amp;amp;amp;amp;amp;lt;a href="https://codepen.io/gabrielalanza"&amp;amp;amp;amp;amp;amp;amp;amp;amp;gt;@gabrielalanza&amp;amp;amp;amp;amp;amp;amp;amp;amp;lt;/a&amp;amp;amp;amp;amp;amp;amp;amp;amp;gt;) on &amp;amp;amp;amp;amp;amp;amp;amp;amp;lt;a href="https://codepen.io"&amp;amp;amp;amp;amp;amp;amp;amp;amp;gt;CodePen&amp;amp;amp;amp;amp;amp;amp;amp;amp;lt;/a&amp;amp;amp;amp;amp;amp;amp;amp;amp;gt;. In any case, you'll receive a response that's a long string of letters and numbers. The most important part is the "success" parameter, which gives you the necessary information to accept or reject the submission. As for the other information in the response, the "challenge_ts" is the time when the reCaptcha challenge was rendered (ISO format yyyy-MM-dd'T'HH:mm:ssZZ), and the "hostname" shows the website where the reCaptcha was solved. Now that we have invisible reCaptcha working on our website, let's see what options we have to customize it. See the Pen &amp;amp;amp;amp;amp;amp;amp;amp;amp;lt;a href="https://codepen.io/gabrielalanza/pen/zEYENa/"&amp;amp;amp;amp;amp;amp;amp;amp;amp;gt;zEYENa&amp;amp;amp;amp;amp;amp;amp;amp;amp;lt;/a&amp;amp;amp;amp;amp;amp;amp;amp;amp;gt; by Gabriela Lanza (&amp;amp;amp;amp;amp;amp;amp;amp;amp;lt;a href="https://codepen.io/gabrielalanza"&amp;amp;amp;amp;amp;amp;amp;amp;amp;gt;@gabrielalanza&amp;amp;amp;amp;amp;amp;amp;amp;amp;lt;/a&amp;amp;amp;amp;amp;amp;amp;amp;amp;gt;) on &amp;amp;amp;amp;amp;amp;amp;amp;amp;lt;a href="https://codepen.io"&amp;amp;amp;amp;amp;amp;amp;amp;amp;gt;CodePen&amp;amp;amp;amp;amp;amp;amp;amp;amp;lt;/a&amp;amp;amp;amp;amp;amp;amp;amp;amp;gt;. ...in addition to the "sitekey" and "callback", there are a few other parameters we can add to this call. This might be the most important customization you might want to do. The badge is the visual that displays Google's terms and conditions. In normal reCaptchas, this is the field containing the checkbox. The "inline" parameter will render the object as close to a normal field as possible. The two other options are very discreet. They render the badge on a bottom corner of your page (left or right, depending on which option you choose). The badge follows your screen as you scroll and an animation shows the full badge (see above) on hover. Just be careful that this badge doesn't cover up anything important on your website! Because we don't know what type of content our customers might have on their pages, and because we use the bottom corners of a webpage for HubSpot's lead flows feature, we chose to keep the badge inline for our customers. It's also helpful to place the badge inline if you want to apply your own CSS to it. But do remember that you agreed to show Google's Terms and conditions when you registered for an API key - so don't hide it, please. And while it is possible to make the badge disappear completely with CSS, we wouldn't recommend it. Whichever you choose, reCaptcha will show an icon so that users can switch between types, so that the challenge is accessible for everyone. This option can be useful if other elements on your page use tabindex and you want to make the navigation easier. The default value is "0", but you can change it so that your user can focus on the challenge after a certain amount of "tab" hits. Note that the three parameters above also use the "data-" prefix if you use a <div> to render your invisible reCaptcha. See the Pen &amp;amp;amp;amp;amp;amp;amp;amp;amp;lt;a href="https://codepen.io/gabrielalanza/pen/EwxwWp/"&amp;amp;amp;amp;amp;amp;amp;amp;amp;gt;EwxwWp&amp;amp;amp;amp;amp;amp;amp;amp;amp;lt;/a&amp;amp;amp;amp;amp;amp;amp;amp;amp;gt; by Gabriela Lanza (&amp;amp;amp;amp;amp;amp;amp;amp;amp;lt;a href="https://codepen.io/gabrielalanza"&amp;amp;amp;amp;amp;amp;amp;amp;amp;gt;@gabrielalanza&amp;amp;amp;amp;amp;amp;amp;amp;amp;lt;/a&amp;amp;amp;amp;amp;amp;amp;amp;amp;gt;) on &amp;amp;amp;amp;amp;amp;amp;amp;amp;lt;a href="https://codepen.io"&amp;amp;amp;amp;amp;amp;amp;amp;amp;gt;CodePen&amp;amp;amp;amp;amp;amp;amp;amp;amp;lt;/a&amp;amp;amp;amp;amp;amp;amp;amp;amp;gt;. See the Pen &amp;amp;amp;amp;amp;amp;amp;amp;amp;lt;a href="https://codepen.io/gabrielalanza/pen/GMRMmg/"&amp;amp;amp;amp;amp;amp;amp;amp;amp;gt;GMRMmg&amp;amp;amp;amp;amp;amp;amp;amp;amp;lt;/a&amp;amp;amp;amp;amp;amp;amp;amp;amp;gt; by Gabriela Lanza (&amp;amp;amp;amp;amp;amp;amp;amp;amp;lt;a href="https://codepen.io/gabrielalanza"&amp;amp;amp;amp;amp;amp;amp;amp;amp;gt;@gabrielalanza&amp;amp;amp;amp;amp;amp;amp;amp;amp;lt;/a&amp;amp;amp;amp;amp;amp;amp;amp;amp;gt;) on &amp;amp;amp;amp;amp;amp;amp;amp;amp;lt;a href="https://codepen.io"&amp;amp;amp;amp;amp;amp;amp;amp;amp;gt;CodePen&amp;amp;amp;amp;amp;amp;amp;amp;amp;lt;/a&amp;amp;amp;amp;amp;amp;amp;amp;amp;gt;. For example, here it's overriding the language reCaptcha's language to French. The full list of languages and their codes is available here. Invisible reCaptcha has worked quite well for us so far. After extensive testing, it doesn't seem less reliable than its predecessor, and it's one less click needed to change a simple website visitor into a lead in our users' databases. And as you can see, the implementation isn't painful as long as you have good documentation. You can also check Google developer's guide for a more thorough explanation of invisible reCaptcha. We hope that this quick tutorial helps you put an invisible reCaptcha on your website in no time. If you happen to have any questions, let us know in the comments.